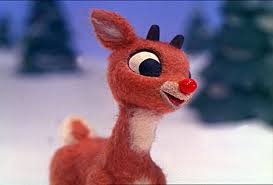 Every year since 1964, Rudolph the Red-Nosed Reindeer airs on television this time of the year. It is one of four Christmas specials from the 1960’s that continue to make an annual yuletide appearance. The others are How the Grinch Stole Christmas and A Charlie Brown Christmas (two of my favorites) and Frosty the Snowman (one of my least favorites). Plus, if you think about it, Santa’s attitude toward Rudolph throughout the entire show is quite self-serving. While Santa is initially impressed with Rudolph’s performance during the reindeer games, once Rudolph’s fake nose falls off Santa quickly changes his tune and scolds Rudolf’s father while the other reindeer children mock Rudolph. Perhaps Santa needs #stopbullying. It is only at the end when Santa realizes that completing his job is dependent on exploiting Rudolf’s unique abilities that he sees any real value in Rudolph. After all these years, I still do not understand the Island of Misfit Toys. Charlie in the Box is there because of his name? Currently on ebay you can buy a Sox Monkey in the Box, a Curious George in the Box, Flipper in a Box, Magic Dragon in the Box and Sponge Bob Square Pants in the Box. There are even 174 listings for Charlie in a Box! So what is the issue here? I think it is his attitude and not his name. What about the train with square wheels on the caboose. Wasn’t Hermey a trained Elf? Don’t you think a trained Elf could have made some round wheels for the caboose? He probably could have helped the boat that sunk to float as well. Why didn’t Hermey help the misfit toys? Seems like if Hermey cared about the misfit toys, he could have helped a few of them out. And by the way, at the end, was it really a good idea to let Hermey begin to practice dentistry in his spare time without any formal training? I wonder if he had any malpractice insurance? Then there was the Dolly for Sue. What exactly was her problem? Apparently Arthur Rankin of Rankin-Bass has stated that Dolly had psychological issues caused by being abandoned by Sue. Well what kid wants a toy with psychological issues? Maybe they could market her as a doll that comes with her very own “baggage.” She reminds me of the “Talking Tina” episode on The Twilight Zone. Then there is Yukon Cornelius. What exactly is he teaching impressionable little ones? He throws his pick-axe into the snow, picks it up and licks it in hopes of finding silver or gold? That has got to be quite unsanitary and who would want to risk getting metal splinters on their tongue? Yet perhaps the cruelest moment in the show is saved for the end. It is supposed to be a feel good moment as Santa delivers the long forgotten misfit toys. Remember how an Elf comes out of Santa’s bag and starts giving each misfit toy a little umbrella as a parachute as he sends it to gently drift down to its new home? Next time you watch Rudolph pay close attention to the misfit bird. Remember the bird is a misfit because it can swim BUT IT CANNOT FLY. The Elf holds the umbrella in one hand and the bird in the other, then he pauses and lets go of the swimming bird> He waves “bye-bye” as the “bird” no doubt plunges quite rapidly toward the earth. And all these years, you though Rudolph was a nice, innocent, little story. This entry was posted in Humor and tagged Christmas Rudolph on December 8, 2014 by Leonard.